Derived from two Sanskrit words, ‘Yoga’ signifying union or one-pointed awareness, and ‘Nidra’ meaning sleep – Yoga Nidra is one of our most commonly enjoyed deeper practices that Anahata has on offer. Yoga Nidra is a practice which leads you progressively deeper into a state of pratyahara (sense withdrawal), through to dharana, (concentration) and gradually into the state of dhyana (meditation). 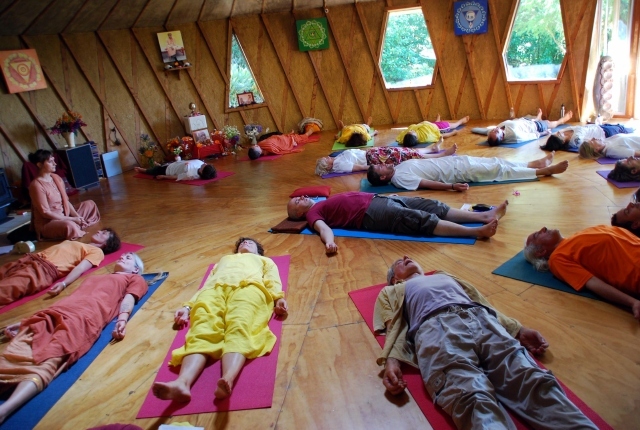 Ultimately, it is said that Yoga Nidra can awaken the highest state of consciousness. In light of this, we thought it might be useful to point out five ways Yoga Nidra can transform your world. At its most basic level, Yoga Nidra helps calm the nervous system, turn on the relaxation response and create more equilibrium in the body, mind and emotions. It creates a space from the over-stimulation of a fast-paced modern life. There is a systematic release of the gross and subtle tensions carried in the muscles, the breath, the nervous system and the mind, which leads to deep relaxation at all levels.. The release of these tensions helps to balance the autonomic nervous system, appeasing the ‘fight or flight’ response our bodies create when faced with stress. In turn, the parasympathetic response, the relax and digest part of the nervous system increases. When relaxation occurs, the body can heal. Feel good hormones are released, we experience vitality and can face life with positivity – this is when the magic of Yoga Nidra really happens. From yogic and psychological perspectives, the roots of many physical, mental and emotional issues can be found in the unconscious and subconscious mind. Yoga Nidra works directly on the mind to release impressions from the past and anxieties about the future. Yoga Nidra has proven to be of great healing power in helping with psychosomatic diseases such as high blood pressure, asthma, insomnia, PTSD, depression, chronic pain, motor impairment, diabetes and allergies. These conditions are often caused by the mind due to stress, anxiety and tension. The root cause of many of these conditions are found deep in the subconscious or unconscious mind. By using a structured Yoga Nidra practice we can gradually release these roots to greatly improve our health on all levels. The stage of opposites in Yoga Nidra connects us with the primitive part of the brain called the emotional brain or limbic system that is responsible for survival. By consciously invoking opposite emotions and sensations which are normally unconscious, whilst we are in a relaxed state of being, we grow our ability to stay calm and balanced in the inevitable ups and downs of daily life. We gain more mastery over both physiological and emotional experiences which helps create more of a balance between the right and left sides of the brain. An important part of the Yoga Nidra experience is the conscious repetition of a Sankalpa, or positive statement of intent. Used in a similar way to an affirmation, the Sankalpa is used to raise our level of vibration and actively manifest our reality. It is a powerful tool for planting a positive seed in the subconscious mind and is the creative aspect of Yoga Nidra. After you reach a state of calm – your mind becomes more relaxed and receptive . You then plant your seed of positivity with conviction, faith, and determination.The Sankalpa is a powerful way to focus the mind and give energy to that which we wish to create in our lives. When practiced regularly, studies have shown that the Yoga Nidra practitioner can reach a threshold between sleep and wakefulness. This is, where contact with the subconscious and unconscious dimensions occurs due to a detachment from external stimuli and the internalisation of awareness. Yoga Nidra gradually increases the ability to remain present and mindful both during the practice and in daily life. Over time, we are able to expand our awareness externally yet stay in contact with the inner nature. This presence transforms each and every moment into opportunities for growth and expansion. The practice of Yoga Nidra is an essential daily ingredient to give us a gap, a space, a pause. When used regularly, it provides us with the opportunity to come back to our centre, so that we can manage the onslaught of life experiences whilst being healthy, happy and present. If you’re interested in finding out more on Yoga Nidra, Anahata offers a Yoga Nidra & Restorative Yoga Instructor Training Program as well as a Yoga Nidra 5-day Immersion Retreat.